Aquired by the National Art Museum of Catalonia, Barcelona 1905. Ref: 15803 MNAC. La Seu d'Urgell was an important center of Romanesque panel painting. 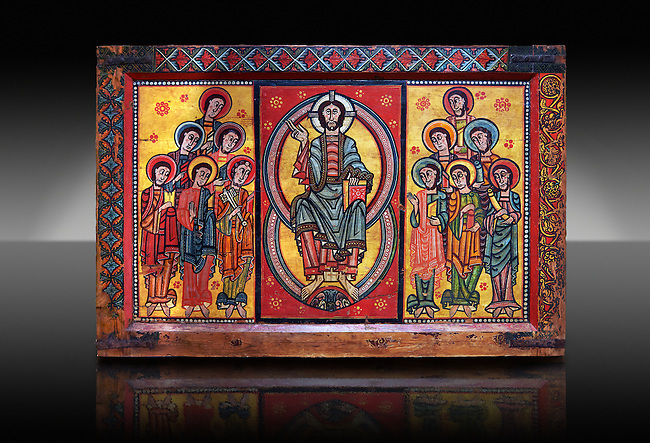 This altar front is one of the best examples, and is also one of the oldest preserved painted panels in Catalonia. At its centre is Christ Pantocrator surrounded by a Mandorla. Either side of this are the 12 Apostles arranged in two unusual pyramid shaped groups of six. This altar panel is a fine example from the workshop Urgell and demostrates a high standard of technical ability and creativity.